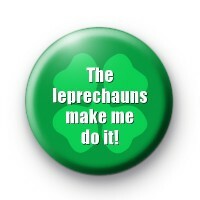 The leprechauns made me do it badge in green with a light green four leaf clover and white text which reads The Leprechauns Made Me Do it. Celebrate St Patrick's Day in style with our St Patricks Day badges. Our St Patricks Day badges are some of our most popular badge designs and we have an entire category dedicated to St Patrick's Day. Check out the rest of our St Patrick's Day badges and grab some for this year. Standard 25mm badge made in our UK workshop.